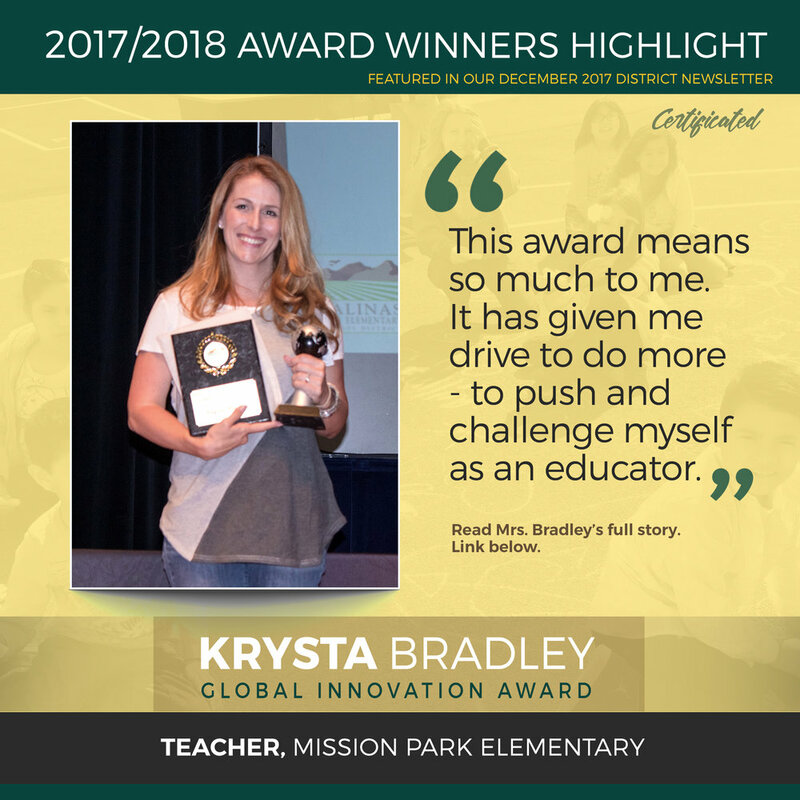 For our second interview, we spoke with Global Innovation Award Winner, Krysta Bradley. I have been a part of SCESD since I was 4 years old! I went to Monterey Park and have lived in the area my whole life. SCESD is where my own children attend school and I can’t imagine being a part of any other district. My students and their excitement about learning keep me motivated on a daily basis. I love seeing them have an “A-Ha!” moment or the look on their faces when they are sharing something they are proud of. I am also blessed to be a part of a school community that has supportive administrators and parents, teachers/friends that share ideas and support one another, and students who love learning as much as I do. This award means so much to me. It has given me drive to do more to push and challenge myself as an educator. The most gratifying (and in many ways, challenging) thing about my job is doing something every day that matters. I have had several jobs in my life that were less than enjoyable. In this profession, I wake up and look forward to coming to work because I love what I do. I would tell a new educator to not be hesitant to reach out for support. We have all been where you are and undoubtedly remember what that first year (or two or three) was like. I would also say to share your ideas; don’t be shy. You have just as much to offer to your school as anyone else.